Have you mastered a proper pop-up? Can you read oncoming waves? Can you select, paddle, and catch a wave on your own accord? Can you turn down the line and ride an open-faced, green wave? If so, congratulations. You are ready to learn how to generate speed and set up maneuvers. Generating speed on a wave ensures the longest possible ride, and allows the surfer to set up further maneuvers, such as cutbacks. There are two ways to generate speed on a wave: trimming and carving. Whether you use trimming or carving depends on a variety of variables like board size, wave type, maneuver goals, and wave size. To find out how to properly generate speed on a wave, and whether you should be trimming or carving, keep reading! 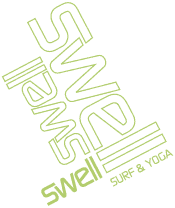 At Swell , we are here to help improve your surfing for your next surf trip to our Caribbean surf resort, or just for your surfs at your local break back home! Trimming is a technique employed when a surfer needs to maintain speed and navigate the face of a wave to stay in an optimal position to continue surfing at a high speed or to set up a maneuver. Unlike carving, trimming does not involve large, rounded turns but rather, trimming requires delicate rail work. The rail is the side of a surfboard, and it is the part of the board that is most engaged in the wave face during trimming. When a surfer trims, he or she makes small adjustments in his or her weight distribution and stance to set the rail into the wave’s face and then to release it. This act moves a surfer quickly down the line, keeping her or him ahead of the breaking water. While there are a number of factors that go into whether you trim or carve on a wave, the wave itself sometimes won’t give you a choice. A fast-breaking wave makes it virtually impossible to perform regular, elongated carves. Therefore, on a fast-breaking wave, you have no choice but to trim. It is possible to trim on all board types. In fact, trimming is useful in a variety of situations on shortboards and longboards. But if you are a longboarder, you will find that you will be trimming on most waves, even if short boarders are carving. The large surface area and volume that long boards have makes generating speed as simple as walking up the board. To trim properly on a longboard, a surfer should move towards the center of their board and set their rail into the wave and then release it as needed. Longboarders use trimming to set their board, to walk to the nose, or to set up a cutback. Short boarders use trimming to gain speed for an air/ cutback off of a high line, to navigate a barrel, or to stylishly cruise on a high line. Whether you are on a longboard or a shortboard, trimming takes a specific stance, weight distribution, and technique. To effectively trim, a surfer should be positioned more towards the center of the board, have a stance slightly wider than shoulder width, and have their feet placed somewhat closer to the rail that is engaged in the wave’s face. As you move down the face of the wave, lean in and put your weight towards the wave to move up the face, engaging your rail into the wave. Additionally, your weight should be distributed more to the front foot than the back. This is referred to as putting on the gas. Once you’re high enough on the wave, faintly let your rail out and allow your board to move down the wave before reengaging and moving back up. If you’re trimming properly, there are a few maneuvers that you will be able to work on. From a proper trim or high line, you can execute a cutback, set up an air, or if you’re on a longboard, walk the noise. You can also execute floaters on a closeout section. Carving is a way of moving down the face of the wave and generating speed while doing so. Carving involves larger, deeper, and more radical turns than trimming. A surfer carving will make a series of bottom turns and top turns down the waves face until the end of the wave, the whole time utilizing their fins to make sharp, dramatic turns on the wave’s face. While it may be possible to do a few top or bottom turns on a fast-breaking wave, the ideal wave for carving is a slow breaking, somewhat steep-faced, wave. A slow breaking wave allows for a surfer to do a drawn-out bottom turn to drop in, without risking getting caught by the whitewater, and then set up a succeeding top turn. This act is repeated over and over down the wave’s face. To properly execute swooping bottom turns and sharp top turns that are required in proper carving, a shorter board is required. While it is definitely possible to carve on a longboard, it is difficult given the board’s length and the distance of the rider’s feet from the fins and certain points in the wave. A shorter board (anything below 7 feet) will allow you to maneuver more freely and whip the board around for sharper, more dramatic turns. Like trimming, carving takes a particular stance, technique, and weight distribution to be done successfully. To effectively turn sharply, whether a top turn or a bottom turn, a surfer must “pump the brakes.” Meaning the surfer must put their weight on their back foot to engage their fins in the wave and allow the board to turn sharply. When you are ready to perform a carve, put weight on your back foot and slightly towards the rail that is engaged in the face of the wave. Then as you turn, shift your weight forwards and towards the direction of your turn. For example, when you engage with your toeside rail in the face of the wave and you want to perform a cutback, then lean into the wave’s face and then engage the fins, rotate your board, and shift your weight to the other rail. When a surfer places weight on their back foot, the nose of the board lifts out of the water just enough to allow the surfer to pivot the board using a combination of the engaged fins and rail. High-performance surfing essentially is carving. With the exception of airs, most traditional high performance and power surfing maneuvers involve large cutbacks, swooping turns, and powerful hacks into the waves face. If a surfer wants to improve their performance surfing, the first thing he or she should do is learn how to properly carve. Armed with the knowledge on how to properly trim and carve, you are ready to get out in the water and work on generating speed on a wave. Once you’ve successfully mastered generating speed, move on to learn how to set up maneuvers and learn to look for workable sections in a waves face. To further your progression, come visit us in the Dominican Republic at Swell to surf the warm, welcoming waters of the Caribbean Sea! We hope you like this article “Surfing: How to generate speed” But if you have any questions about this topic, feel free to send us an email about this topic (or any surf related topic) I am sure we can help you progress with your surf abilities.